You may not realize it but you can easily suffer from dehydration on board an aircraft, especially on long flights. That's because air in an airline cabin is usually much dryer than air on Earth. Humidity refers to the amount of water molecules in the air. Our comfort zone as people is around 50% - meaning the air is 50% saturated with water. Air in an airline cabin can fall to as low as 1% on long flights. Dehydration on flights, doesn't only mean you'll feel thirsty. It means your body will lose water so you'll end up having a dry nose, dry scratchy bloodshot eyes, and dry itchy skin. This shouldn't frighten you. There are many ways to get around this and this page will show you how. The first thing you should do is take plenty of bottled water on the flight. Drink about eight ounces of water every hour on the flight. That's about 240 cc/ml. 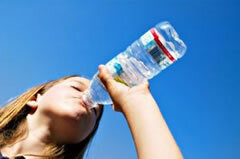 Drink some water before the flight too so your body will be prepared for the dry conditions on the airplane. If you already get on the airplane and you only remember this tip after the airplane has taken off then ask the flight attendants for bottled water of canned water. Avoid tap water on airplanes. Sadly, there are set standards for airplane tap water so avoid drinking it. Tell your children to avoid drinking it too. 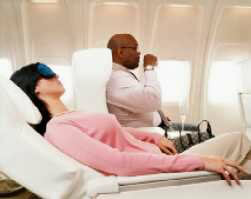 You might love to drink alcohol and coffee but avoid them on the flight. Alcohol and coffee are diuretic drinks. That means they actually absorb water out of your body cells. They'll actually get you more dehydrated. Stick with the water and your body will be just fine. Immerse a handkerchief in your drinking water and place it above your nose if you want to breathe in humidified air. Wrap it around your ears and place it atop your nose for as long as you desire. You might also want to sprinkle your face with water using a perfume bottle. Fill it in with your own drinking water before the flight. If you're very concerned about dehydration on flights and dry air, or if it has always bothered you, you might want to smear vegetable oils in your nostrils to protect the mucous membranes of your nose. Avoid using petroleum jelly and go for almond oil or Jojoba oil. But this is only in extremes and pilots and flight attendants who are always flying rarely ever do this. After you land immerse yourself in some water so your skin can get moisturized. Take a good bath or jump in the warm ocean, your body will feel better and will get hydrated right through the pores of your skin. Getting dehydrated on a plane shouldn't bother you. Take the above precautions and you'll never have to worry about it.